We are a full-service residential property management company serving Tampa Bay. We strive each day to provide customer service that our clients deserve and expect. We put a great deal of emphasis on finding quality tenants, maximizing owner revenue and maintaining a high level of communication. Feel Like A Priority: Consistent communication and regular updates. No Risk Contract: Unsatisfied with our service? Cancel at any time without cause or penalty. Comprehensive Tenant Screening Process: Includes credit, criminal, eviction and sexual predator reports. Also employment, rental and income verification. Stay In Control: You make the final decision to accept or deny each applicant. You Only Pay For Results: We are only compensated if we place an agreed upon qualified tenant. No Hidden Fees: No start up fees, no lease renewal fees, no junk fees or surprises. 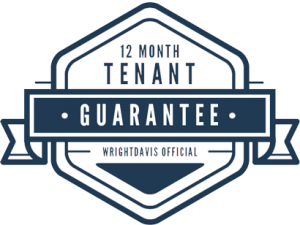 12 Month Tenant Guarantee: Click here for more details. You pay nothing up-front. We’re only compensated when we place a qualified tenant in your home that you approve. And with no lease renewal fees, maintenance fees, or any other junk fees, you’ll be able to spend your money on things that matter. We put a great deal of emphasis on finding good, quality tenants. You can rest easy knowing we put every applicant through a very detailed screening process. If any tenant approved, placed and managed by WrightDavis Property Management vacates or defaults on their lease agreement, we will find a replacement tenant at no cost to you. Please click here for additional information. We want you to feel comfortable with the entire property management process. You make the final decision to accept or deny each applicant and have control over maintenance spending. WrightDavis Property Management is so confident that your tenants will be some of the most responsible, reliable people, we give you the absolute BEST tenant guarantee in the industry! When it comes to tenant screening, we do our homework. If ANY tenant approved, placed and managed by WrightDavis Property management vacates in default before the end of their 1 year lease agreement we will find a replacement tenant for FREE. LESS STRESS, MORE SUCCESS…. LEASE YOUR HOME WITH CONFIDENCE!